Despite the cold weather, I’ve still be following the food trucks during lunch hour. 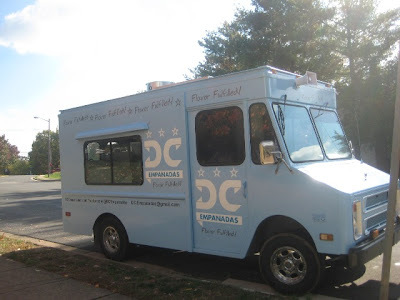 Most recently I had the pleasure of enjoying DC Empanadas, one of the newest additions to the DC mobile lunch scene. I ventured over to the truck at the end of the lunch hour and found that most of their flavors were sold out. Fortunately, I was still able to order the The Traditional (ground sirloin, Spanish olives, hard boiled eggs, raisins, onions, and seasoning) and was far from disappointed. After the first bite I understood why they were low in inventory, those empanadas were so good! The Traditional tasted like chili swaddled in a warm, fried crust - perfect for a cold winter day. My only regret was that I didn't order more. If you are looking for a filling lunch, I’d order the 3 empanadas for $9 deal. For a quick snack, one will suffice at $3.50. I can’t wait to try more of the flavors from their extensive list, hope they visit L’Enfant soon (hint hint).